GoXtra News: WOOLWORTHS launches "ARE YOU WITH US" a sustainable collaboration with Pharrell Williams! 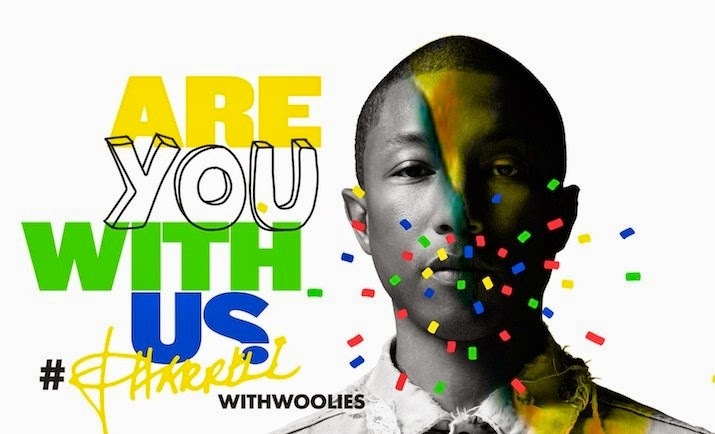 WOOLWORTHS launches "ARE YOU WITH US" a sustainable collaboration with Pharrell Williams! CEO for Woolworths Holding Limited, Ian Moir, has announced a partnership with Grammy Award-winning musician, record producer and philanthropist, Pharrell Williams. The strategic collaboration is the first of its kind for a South African retailer, and will see the global superstar and the business align their values and actions to make a difference in the lives of people, and the planet. Williams takes on the role of Style Director in a ground-breaking collaboration across a series of sustainability-focused projects. The partnership is a strategic one, grounded in a strong set of shared values. “Pharrell is a global icon for social cohesion, advancement through education and environmental awareness – these same values lie at the heart of our business and form the foundation on which this partnership is built. We hope Pharrell will help us make sustainability cool for the next generation of South Africans and help us create a better future for our children, our country and our planet,” says Moir. The Woolworths Good Business Journey is the driving force behind the partnership between Williams and Woolies. Launched in 2007, Woolies’ GBJ is a commitment to ethical trade, sustainable farming and production methods, and social responsibility. The call-to-action for the collaboration is “Are you with us?” and it asks customers to pledge their allegiance and support for the Woolworths Good Business Journey. Woolies has collaborated with Bionic Yarn®, a company that creates fabric out of recycled plastic waste, to create a range of limited edition, sustainable t-shirts. Design students are invited to create and submit designs for these t-shirts that celebrate sustainability. Pharrell will select his favourite designs and these will be produced and sold in Woolies stores across the country. Winners will each receive R25 000 in prize money. Pharrell and MySchool will be calling on customers to help us raise R100 million for schools in need across South Africa through swiping their MySchool MyVillage MyPlanet cards. The more you swipe, the more you donate – the more you make a difference to schools around the country. Signing up for a card is easy and free – and you get to choose which schools benefit. School singing groups are invited to practice their songs and get ready to compete to win the once-in-a-lifetime opportunity to perform live alongside Pharrell Williams in front of the whole country during his MySchool concert tour of South Africa. Entrants will be shortlisted and chosen personally by Pharrell to appear alongside him on stage in September as part of an exclusive concert forWRewards Members only. If you’re not a Woolies’ WRewards or MySchool cardholder, now is the time to sign up. Members stand the chance to win a ticket to an exclusive, one-night-only private Pharrell Williams concert, exclusively for members. The only way to get a ticket to this one-night-only event is to be a Woolies WRewards / MySchool / Credit cardholder. “We’re on a mission to change the world. To make a difference wherever we can. Earlier this year at Davos, we announced the launch of ‘Harmonising Humanity’. To call together everyone around the world who believes that a better tomorrow is possible when we all do our part. For those who believe in clean lakes, rivers and oceans - who care where their products come from - and who are giving to make sure every kid gets the best shot at a great education. This is very near to my heart. We want to bring together everyone who cares about making a difference. They are a global blueprint for how good businesses should do good business. Today we are announcing a new collaboration. To work together to uplift education in South Africa. For food farming that goes easy on the planet. And to create fashion that is not just cool, but also sustainable. So, join me and Woolworths on this journey to make a difference.